Fortunately Don is able to save Mike from death. Mezcaal asks if they should take the fallen Turtle to the hospital, but Don explains that no hospital has the means to take care of a mutant. The brainy terrapin then laments that while Mike is safest at Turtleco, he doesn’t feel right leaving him alone. Leo states that his students will watch over Mike. The three brothers then activate the Time-Slip Generator and jump through its portal. Onboard Verminator’s ship, he and his new alien ally Craniac devise a plan where they will sell the esoteric human brains to another alien race incapable of dreaming as a form of entertainment. Back in the past, we discover that the brain that was attached to the Time-Slip Generator is none other than Adolf Hitler’s. It has somehow managed to create a robotic body for itself and is searching the ruins of Berlin for its former self. Soon after the Hitler robot has killed a member of the resistance and moved off, Raph, Leo and Don arrive. They discover the body just as more men arrive. Thinking that the Turtles killed their friend, the fighters open fire. The Turtles escape, but run headlong into a group of Nazis, who are lead by Adolf Hitler. The Turtles dive for cover as the Nazis open fire. The Hitler Bot arrives and attacks Don, but it’s caught in the crossfire and the bubble protecting it is shattered. Adolf rushes to retrieve his brain, but Raph confronts him and knocks him cold. The Turtle picks up the brain and the three mutants head back to where the Time-Slip Generator is set to open a portal. As they wait for the passage to open, Hitler arrives and holds a pistol on our heroes. Leo convinces the maniacal dictator that the Turtles are demons and that Hitler is in Hell. Hitler asks if they’ve come for his soul and Leonardo replies that they already have his soul, they’ve come for his brain. Hitler holds the pistol to his head and states that they can’t have his brain, and then pulls the trigger. 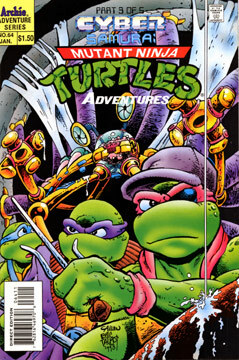 The TMNT jump through the portal and arrive back at Turtleco, only to be confronted by Verminator X and Craniac – who force the Turtles to hand over Hitler’s brain at gunpoint. The villains board their ship and crash through the walls of Turtleco, making their escape. As the craft blasts off, we see that Michaelangelo has grabbed onto its hull and is being carried off.